Although it is better to feed your dog regular, monitored meals – especially finicky or overweight chow hounds – you may sometimes be called from home at doggie mealtimes. 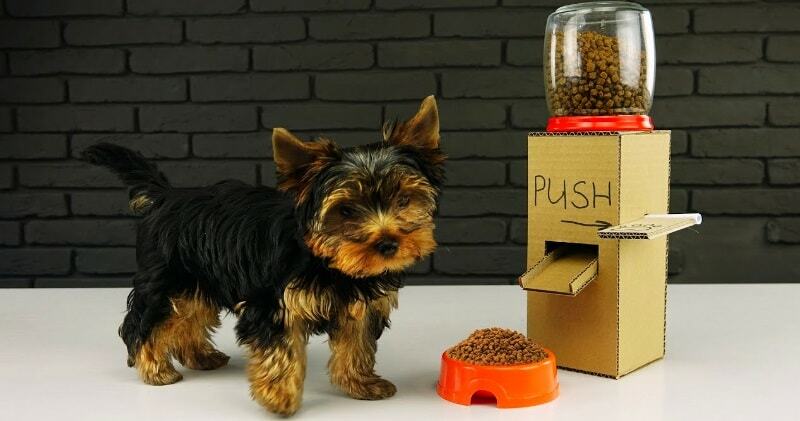 No worries – you can make your pup an automatic food dispenser and he can dine happily despite your absence. In this video I show you how to build amazing food dispanser for your dog, cat or any other pet .You need jar, 1 pipsicle stick and of course cardboard. Just follow the instructions in this video and you get awesome food dispenser! If they were living on their own, scavenging animals like dogs would spend a large part of each day looking for things to eat. For most dogs, getting hold of food is the single most interesting and satisfying activity in the world. It occupies their brains and their noses and leaves them happily relaxed.